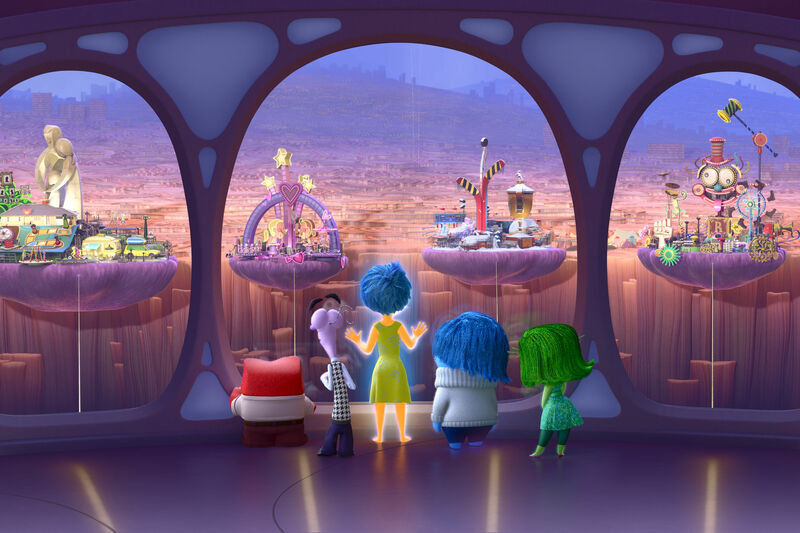 In short, Inside Out takes us inside the mind of 11-year-old Riley (Kaitlyn Dias), whose every action is ruled by one of five emotions—Joy (Amy Poehler), Sadness (Phyllis Smith), Anger (Lewis Black), Fear (Bill Hader), and Disgust (Mindy Kaling)—and whose memories are cataloged in her mind as little video marbles, colored by their ruling emotion. The most prevalent color, naturally, is Joy’s sunny yellow. Together, these five rule the control center of her mind, and dictate her actions and reactions. The genius of the film lies in the fact that, in the end, nothing needs to be fixed. Instead, Joy learns the importance of Sadness, who had previously been shunned away from “ruining” Riley’s moods. All five of the emotions learn that you need all of them to coexist and intermingle to have real feelings; you can’t be happy all the time. 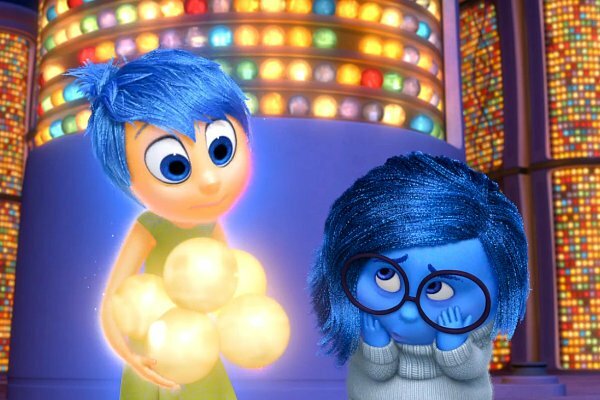 This is a film that tells kids it’s okay to be sad, or angry, or scared, or annoyed. That you don’t have to be happy all of the time. And that’s a really important message for kids to learn. Joy and Sadness struggle to coexist, at first, but ultimately both are needed. It helps, of course, that the acting is top-notch. Poehler as Joy is an outsized, Tinkerbell-like pixie who flits around the control room trying to keep Riley ever-smiling. And Smith as Sadness is morose and downtrodden, not just in her cadences but in her viewpoints—”I remembered a funny movie,” she says at one point. “It was the one where the dog dies.” And Dias is amazing as an 11-year-old girl struggling to maintain her emotional state; her voice cracks and breaks and flatlines with the genuine childhood quality of feeling everything so very, very deeply. From an artistic standpoint, too, Pixar has seriously outdone themselves. The worldbuilding in this film is impeccable, covering all aspects of self from “Imagination Land” and “Dream Studios” to the visually intimidating long-term memory storage, walls and walls filled with memory spheres. Riley’s personality islands are fed by her actions—playing hockey, her favorite sport, lights up her hockey island, while lying to her parents causes the family island to crack and crumble. And science suggests that many aspects of the mental organization are accurate in design, if not in colorful execution. The winding, unending shelves of memory storage. The implications of this world, too, are fascinating to examine. What if someone was unable to regulate their emotions properly? Depression can be pictured as Sadness taking too much control, or anxiety by an excess of Fear’s reactions. And it illustrates how such imbalances can lead someone down a path away from who they truly are, just by being unable to respond correctly. 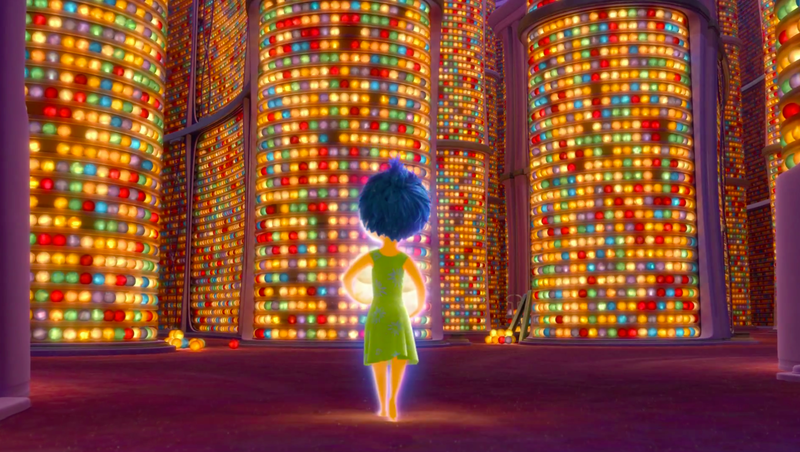 Inside Out takes us within a single girl’s story, but it opens the door outward. It’s a movie about a family, about friendship, about identity. It’s a movie about awareness and acceptance of unpleasant emotions. At its heart, it’s a movie about loving everything about oneself — including the difficult parts. As an aside, the preceding short film Lava is also adorable. It’s a love story about volcanoes!